In engineering practice, basic and applied research in heat transfer is increasingly important as it play a crucial role in the design of vehicles, power and process plants, cooking and heating devices and even IC chips, among other things. Performance enhancement of any such devices is a constant effort which can be achieved through the studies of heat transfer. 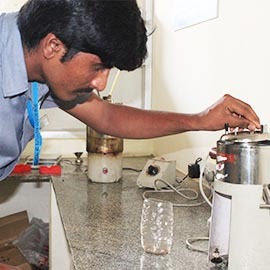 The course of heat transfer laboratory throws light on understanding of three modes of heat transfer such as conduction, convection and radiation and heat transfer by phase change. It covers experiments such as determination of thermal conductivity of metal rod, heat transfer through composite wall, natural and forced convection heat transfer, transient heat conduction, heat transfer through fins under natural and forced convection conditions, determination of Stefan-Boltzmann constant and emissivity of grey surfaces, boiling and condensation, performance test on vapor compression refrigerator and double Pipe heat Exchanger. 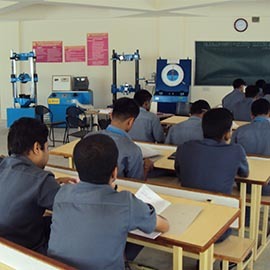 These experiments shall cover the way for the students to understand and appreciate the basic concepts of heat and mass transfer by providing in-depth practical exposure. Also the students shall be able to develop basic skill-sets in order to take up higher level experimental studies in heat and mass transfer in future.